Is a Notary required for the Authentication and legalization of a document in Canada? You Are Here:Home/Authentication and Legalization Process/Is a Notary required for the Authentication and legalization of a document in Canada? Certain documents require the services of a Notary before being able to be authenticated by the Department of Foreign Affairs, Trade and Development Canada (DFATD) Authentication and Service of Documents Section (JLAC). This requirement applies if the document does not have the required signature to allow for authentication or if the original document needs to be kept for future use in its original condition. 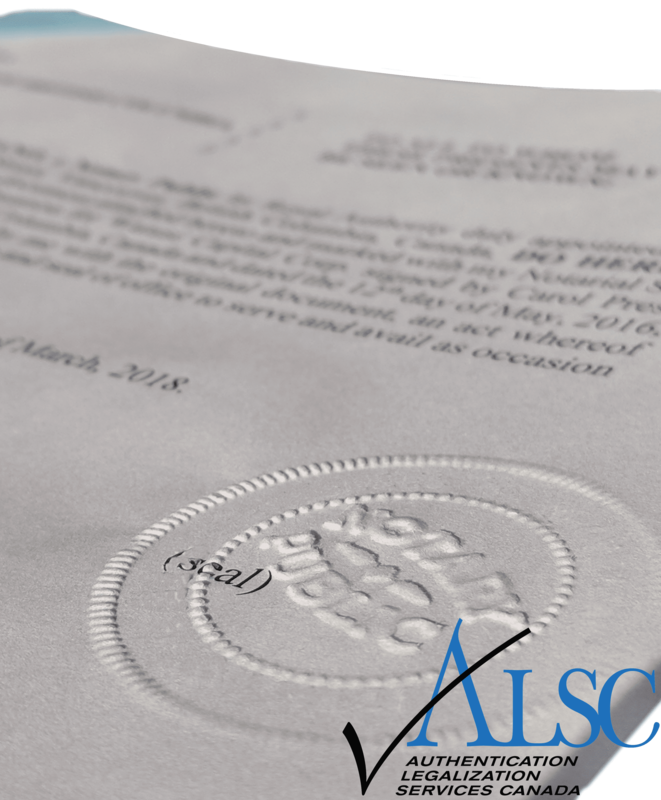 In these cases a Notary will produce a certified true copy after examining the original, stating this fact on the document and affixing their signature and seal. In addition to certified true copies we offer full Notary services as required, allowing for the authentication and legalization of your document for use outside Canada. All of our Notary’s are registered with Official Document Services ODS (Ontario) and Foreign Affairs JLAC here in Ottawa. Some of the more common documents that we notarize are Birth Certificate, Marriage Certificate, Diploma, Degree, Transcripts, Power of Attorney, Corporate document, Court document, Divorce Order, Divorce Certificate, Passport, Health Canada Medical Device Licence, Certificate of Pharmaceutical Product (CPP Certificate), International Trade Certificate, Good Manufacturing Practices Certificate of Compliance (GMP Certificate), CRA Tax Certificate and more ask us about your document. By Authentication Legalization Canada|2018-03-27T10:55:10+00:00November 20th, 2013|Authentication and Legalization Process|Comments Off on Is a Notary required for the Authentication and legalization of a document in Canada?